Bi-fold door. Bi-folds. Folding door. A full or half louvered door has fixed slats or louvers which can provide some necessary air circulation. - Closet doors, see TIP to the right. - Furnace rooms. When finishing a basement too often the furnace room has inadequate air circulation and is barely large enough to service the unit . It is highly recommend to install full-louvered doors for the furnace room to provide more combustion air for the gas or oil fired furnace and water heater. As the name already suggest bi-fold doors are doors that fold together when the door is opened, see photo. A by-fold door has two sections (panels) that are hinged together. Door hardware kits contain adjustable brackets, end pivots and an overhead metal track. Once the door is installed, height off the floor and space between door and door jamb can be easily adjusted for a proper fit. Bi-fold panels can be mirrored, solid, hollow core, half-louvered or full-louvered. Bi-fold doors are ideal for areas where a normal swing door would take up too much space. They are mainly used for bedroom closets but can also used for furnace rooms and laundry rooms. Back in the 70s hollow-core mahogany ( for staining) and Masonite (for painting) slab bi-folds were in high demand. Today's wood grain textured bi-folds are often factory primed and have a two to six panel molded skin. Mirrored bi-fold doors are often used for front entrance, clothes closets, and bedroom closets where they can be used as full length dressing mirrors. Mirrored folding doors can make a hallway or room look bigger and reflect light for a brighter look. Two sectional single doors are advertised and sold in widths of 24, 30, 32, and 36 inches. However the true size is 1/2" less. So, a 24" door measures actually 23 1/2" allowing the door to move freely once installed. The standard height is 80", which can be trimmed if necessary. Make sure you trim from the bottom of the door, not the top! A 24" wide bi-fold door has two panels. 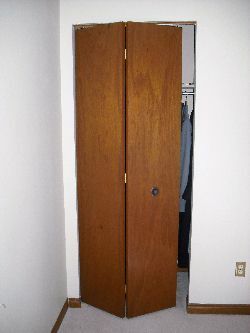 You can use two 24" doors to create a 4' (four sections) wide closet door. Subsequently use two 30" doors or two 36" doors to create a 5' or 6' wide closed door. DO NOT USE FOLDING DOORS FOR BEDROOMS. As a building inspector I have seen bi-fold doors installed for bedrooms, which is prohibited by building and fire codes. If a closet is adjacent to an exterior wall it is strongly recommended to install full louvered bi-fold closet doors to increase air circulation and to prevent mildew problems. Two more tips to prevent mildew problems. 1. Do not place items right up to the wall, leave some space for air to circulate.